Road work is happening from the main road, running 230 meters, to Plaza Tamarindo where the ABC office is located. Curbs and gutters are already done and there is a sidewalk on one side. All the soft dirt was replaced with good solid gravel. According to the engineer, it is expected to be finished in 15 days. This will be a nice improvement for Tamarindo. At last! The gas station opened! 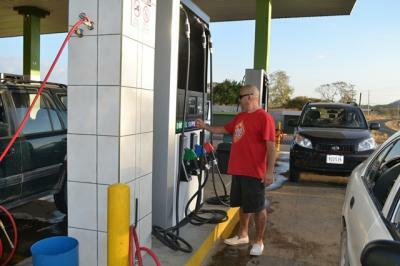 After a long wait, the neighboring communities of Tamarindo, Villarreal, Langosta, Huacas, Pinilla and surrounding areas finally have a new gas station near touristic and residential sites. Enrique Rodriguez, owner of the gas station, told the Tamarindo News months ago, that after a long and cumbersome permitting process, the entry into operation of the gas station would be delayed. And it was! The service station was built months ago and it was not until mid-March that it started selling fuel. Tamarindo News has been giving coverage to this important news, as it is an essential service for the development of the area. In Costa Rica, requesting a permit to sell fuel through a gas station is considered by businesspeople a “real ordeal” and, although all agree that the procedures should ensure the safety of the inhabitants to the danger posed by the storage of flammable materials, the fact is that obtaining these permits can take years. Efforts are made to various public entities, until finally obtaining a site inspection by the Directorate of Hydrocarbons (Ministry of Environment and Energy). Rodriguez told the Tamarindo News months ago that “this is the most difficult process” and he was right. The gas station was expected to open in high season in December 2012; then, in January 2013, but it was not until mid-March 2013 that they were granted the operating permits. Previously, residents of coastal communities of Tamarindo, Playa Langosta, Avellana, Playa Negra and the communities of Huacas, Villarreal, Pinilla and neighboring sites had to travel up to 30 km to fill the tanks of their vehicles. Tamarindo is a resort community and the absence of a gas station was really difficult for tourists and for the operation of businesses such as hotels and restaurants. The only two closest options for residents were the gas station in El Llano and the one located in Belén; there is another one 40 km away in Santa Cruz. Twenty years ago, there was a gas station operating in Brasilito, on the way to Flamingo but it was closed and has not been reopened.